Here are some ideas for day two: enjoy the sand and surf at Mirissa Beach and then get up close to creatures of the deep with a dolphin and whale watching tour. 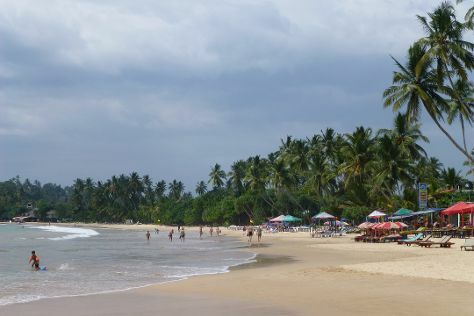 To find photos, other places to visit, reviews, and more tourist information, read Mirissa online trip planner . Chennai (Madras), India to Mirissa is an approximately 9-hour combination of flight and train. You can also do a combination of flight and taxi. Wrap up your sightseeing on the 1st (Thu) to allow time to drive to Tissamaharama. Tourism in Tissamaharama revolves around the town's vast historic and cultural heritage, with the surroundings of scenic paddy fields adding to the ambiance. Kick off your visit on the 2nd (Fri): explore the striking landscape of Yala National Park. To find where to stay, ratings, and more tourist information, read our Tissamaharama vacation planner . Drive from Mirissa to Tissamaharama in 2.5 hours. Alternatively, you can do a combination of bus and taxi. Expect a daytime high around 37°C in February, and nighttime lows around 26°C. Finish your sightseeing early on the 2nd (Fri) so you can drive to Uda Walawe National Park. On the 3rd (Sat), explore the wealth of natural beauty at Udawalawe National Park. To find where to stay, other places to visit, ratings, and tourist information, read Uda Walawe National Park trip planner . Traveling by car from Tissamaharama to Uda Walawe National Park takes 1.5 hours. Finish your sightseeing early on the 3rd (Sat) to allow enough time to travel to Pinnawala. Kick off your visit on the 4th (Sun): identify plant and animal life at Pinnawala Elephant Orphanage and then identify plant and animal life at Millennium Elephant Foundation. To find traveler tips, reviews, other places to visit, and tourist information, refer to the Pinnawala trip itinerary planner . You can do a combination of taxi and flight from Uda Walawe National Park to Pinnawala in 3 hours. Alternatively, you can drive; or do a combination of taxi and train. In February, daytime highs in Pinnawala are 37°C, while nighttime lows are 26°C. Wrap up your sightseeing by early afternoon on the 4th (Sun) to allow time for the car ride to Kandy. On the 4th (Sun), don't miss a visit to Kandy view point. 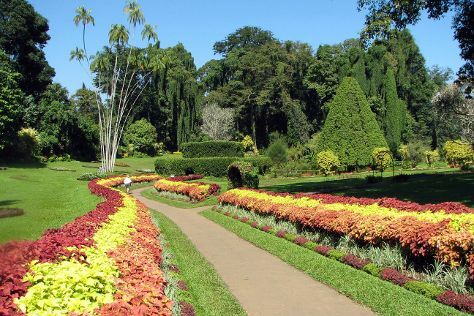 Get ready for a full day of sightseeing on the 5th (Mon): identify plant and animal life at Udawattekele Sanctuary, steep yourself in history at Temple of the Sacred Tooth Relic, and then explore the different monuments and memorials at Kandy Garrison Cemetery. For ratings, traveler tips, other places to visit, and tourist information, use the Kandy vacation planning site . Drive from Pinnawala to Kandy in an hour. Alternatively, you can take a train. You will have some time to spend on the 7th (Wed) before leaving for home.